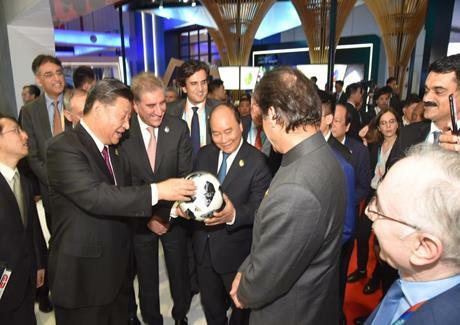 Chinese President Mr Xi Jniping visited Paksitan Pavilion at China International Import Expo in Shanghai. President Xi was accompanied by Russian Prime Minister Dmitry Medvedev, Kenyan President Uhuru Kenyatta, Vietnamese Prime Minister Nguyen Xuan Phuc and Maltese Prime Minister Joseph Muscat. He informed that Textiles and Apparels employ 38 per cent of industrial workforce with 8.5 per cent share in GDP and make up for more than 70 per cent of our exports with leather and made-ups, for many international brands. The fastest growth has been in the garments sector which provides jobs to female workers. He further said that Pakistan has the privilege of not only having the world renowned sportsmen but also has the distinction of competing in quality and winning the contracts for supply of sports goods for top brands and prestigious events. The last two FIFA world cups including the one this year in Russia were played with Pakistan made footballs. Younus Dagha said that with the marvelous archeological sites of the world's oldest civilization in south and the meeting point of the three majestic mountain ranges known as "the roof of the world" in the north, the tourism sector in Pakistan offers unlimited opportunities for the hospitality sector investors. The new government is improving the policy framework to attract more investments in manufacturing sector to increase our capacity to export. He told them that while we are exporting the aromatic Basmati rice, the most delicious mangoes and juiciest of mandarins in more than 70 countries, the storage, processing and preservation are the areas where joint ventures and knowledge transfers can bring rapid gains. Pakistan has one of the smallest carbon footprints (sixth largest population with only 0.4 per cent of world's carbon dioxide emissions), still we are playing a larger role by first completing the project of one billion tree plantations in Khyber Pakhtunkhwa province under the leadership of the Prime Minister during the past few years and now a plan for ten billion tree plantations during the next five years. Prime Minister Imran Khan explained the environment friendly policy and initiatives of the government. President Xi took great interest in the products of Pakistan. He appreciated the Prime Minister's interest in the improvement of the environment and extended his country's support for the initiative. He congratulated the PM Imran Khan on his successful visit.